Ewen Tree House is the extraordinary vision of celebrated architect, Richard Hawkes, known for creating some of the most inspirational and sustainable dwellings in the country. Set within seven acres of mature woodland on the edge of a conservation area, close to the popular village of Ewen in Gloucestershire, UK, the property will offer complete privacy and an unparalleled standard of living. This one-of-a-kind ‘tree house’ design boasts considerable architectural merit. With approved planning permission already in place, Ewen Tree House offers the opportunity to create a long term lifestyle home with practical living space and cutting-edge modern design. A fine example of a Paragraph 55 enabled home which allows for architecturally innovative designs in locations that would otherwise fall foul of planning. Paragraph 55 (recently updated to Paragraph 79) in the National Planning Policy Framework (NPPF) is a policy which allows for new build houses to be built in some of the most scenic parts of England and Wales, subject to certain requirements and criteria. 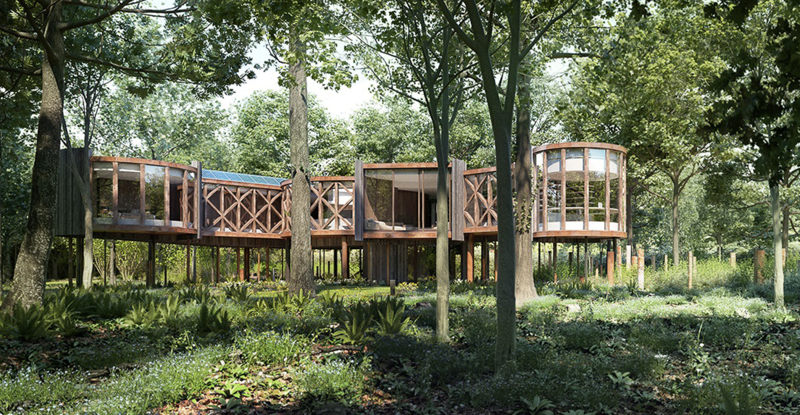 Permission is rarely granted for projects such as Ewen Tree House, offering a buyer the rare opportunity to bring to life a project that has never before been brought to the market. Benjamin Langridge, Savills Cirencester comments, “Ewen Tree House presents an incredibly rare opportunity, allowing a committed buyer to create a truly outstanding and innovative design. Nothing like this has come to market here before so we expect Ewen Tree House to generate interest from all types of buyers including those local to the area to those moving out of London as well as international interest. The eventual buyer will undoubtedly be an architecture enthusiast where there is certainly an appeal in owning a truly unique home. Richard Hawkes, Architect, comments: "Buildings can, and often do, enhance the landscape within which they are set. Sometimes a wonderful landscape can be made even more special with the introduction of an appropriately conceived architecture. Nothing could be truer than with our most recent paragraph 79 consent adjacent to a Conservation Area in a small settlement in rural Gloucestershire. The development plot, with full planning permission approved, is on the market for a guide price of £1million. Build cost from £950,000.